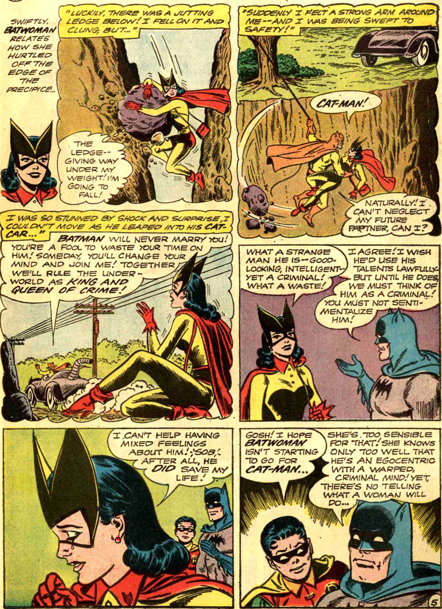 The closest thing to Catwoman in years, Kathy Kane dons a hideous version of the costume in the cover story of Detective 318 (Aug. 63), with art by Jim Mooney. 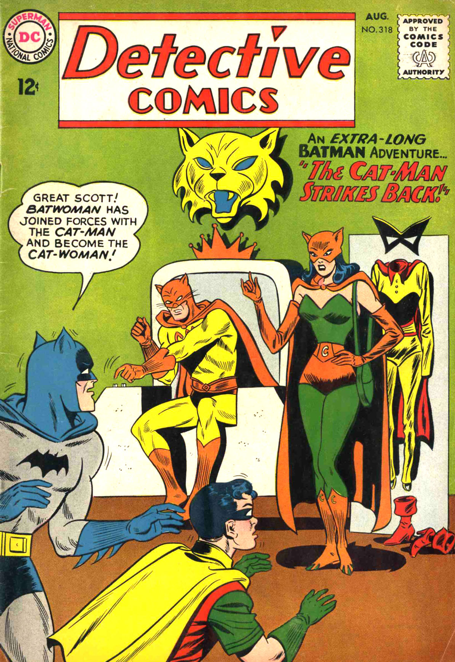 Cat-Man returns and begins crime spree themed to famous cats, and encounters Batwoman while on one of his thefts. Their battle nearly results in her death, but Cat-Man saves her. Batman gets all jealous and barky, and Batwoman runs off to Cat-Man. Oh, the drama! Cat-Man has already created a Cat-Woman costume for her to wear, which I guess he thinks matches his. Kathy changes into the costume, but there is no element of them exchanging identities. 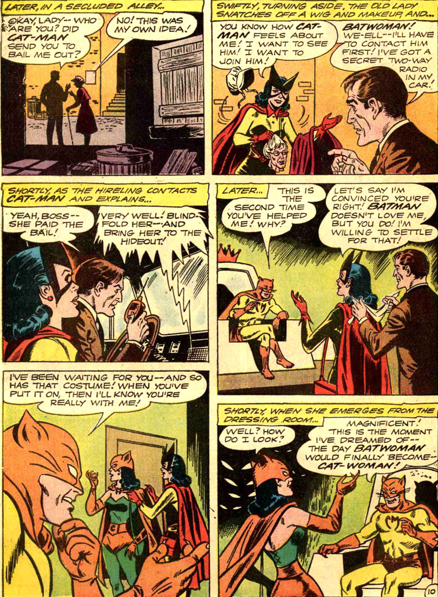 In fact, throughout the Cat-Man/Batwoman “romance,” the one thing seriously missing is a scene of Kathy Kane and Thomas Blake, who must move in the same social circles. When Cat-Man springs a trap on Batman and Robin, Kathy turns on him. Her whole break-up with Batman was a show so that she could get near Cat-Man. 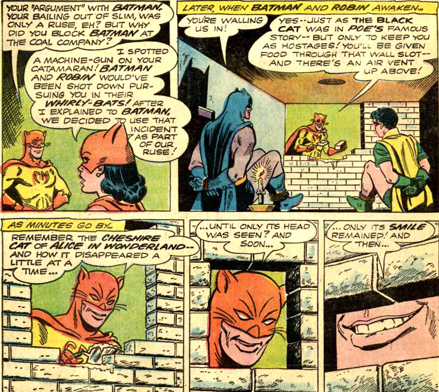 The best scene in the story, by far, has Cat-Man walling up Batman and Robin, while referring to the Cheshire Cat’s grin. Bathound even gets in on the action in this one, although it passes up any dog vs cat scene. Again, Cat-Man appears to die, but the nine lives reference is made, and sure enough he returns in a few months.